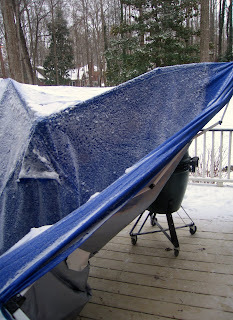 All y'all from climates where you get more frozen stuff can confirm what a bad idea it was for me to put up my tarp the night before the storm. The concept in my head was to protect the cooking area from getting excess "wintry mix"so that I could have unimpeded access to my Egg for ribs today. Good news: the Egg was unharmed and the baby back ribs are doing their thing. We left ours up but I used a broom to knock off the accumulation about once an hour through the worst of the storm. I lost a tarp earlier this year. First the wind blew it over, warping the frame. We put it back up but it was a loose fit so when it rained the next day, it filled up like a pool liner and collapsed like yours. Grrrr. This thing actually collapsed as I was trying to get the accumulation off. Embarrassing. It was a good tarp. I plan on getting a replacement--which I'll treat with a little more consideration.